This weekend was Dan’s 25th birthday. I know, a big deal right? No, you don’t think it’s a big deal? 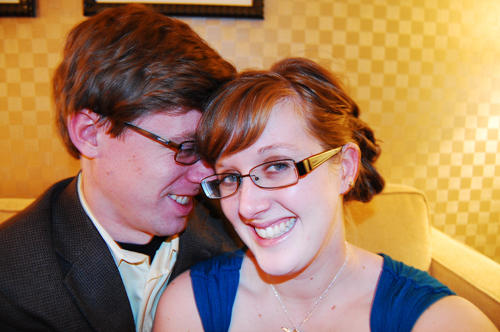 Whatever, we’re pet and childless, we just got married, and this is the biggest birthday we’ve had to celebrate since I turned 21. Incidentally both weekends ended with bacon, egg, and cheese croissants from City Cafe in Baltimore. Emphasis on the bacon. For Dan’s triumphant 25th birthday we took advantage of a wedding present from my mom’s good friends Elaine and Brenda, a stay at Baltimore’s new Hotel Monaco. As you may know, we lived in Baltimore for quite some time, attending the Maryland Institute College of Art. We now live in D.C., but we miss Baltimore and every square inch of that city holds a special place in our hearts. So we spent the weekend taking in some of our favorite aspects of the Charm City. Saturday started with cinnamon rolls and quickly phased into Dan being blindfolded. You see, I’d been keeping the destination of our big weekend away a secret (a difficult task) for months. So I made him wear a blindfold for the drive and doubled back a few times to throw him off. Unfortunately for me he’s been watching too many crime shows in HD because he figured my plan out months ago. Surprise or not we ended up at Holy Frijoles, hands down the best chimichanga I’ve ever had. The service leaves a lot to be desired but it’s always worth it for those chimichangas. After lunch we went to The Wine Source in Baltimore, where Dan picked out some birthday scotch. He picked out a sampler box and a holiday blend. Then it was onto the hotel, where we were upgraded to a suite covered in rose petals. After such an undertaking as the Holy Frijoles chimichanga (and margarita) a nap is in order. So we rested, watched some travel channel, enjoyed some wine and scotch. After the hotel’s complimentary cocktail hour we had dinner at their restaurant, the B&O American Brasserie whose Chef Reidt was named one of the “Top New Chefs” in 2001. Dinner was amazing. So amazing that I was motivated to try both duck and creme brulee for the first time. This morning we awoke to, well, hangovers. We stopped by City Cafe for brunch, indulging in the aforementioned bacon, egg, and cheese croissants. And lots and lots of coffee. When we got home to Takoma Park today we were tired, cold, and beat. Which meant that a trip to the grocery store and the whole “preparing for the week” thing was absolutely the last on my list. Part of my new culinary life list is a commitment to make all of our own bread. 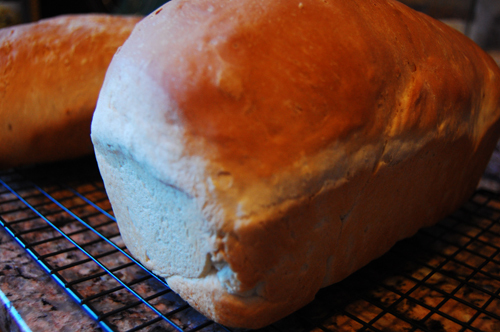 For a few weeks I’ve been baking this delicious white bread from the recipe book that came with our Kitchen Aid Mixer. 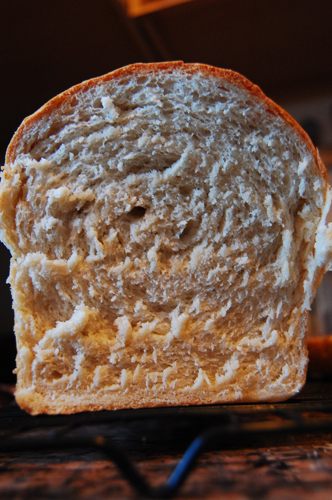 It’s fluffy and just a little sweet with a perfectly crunch crust. It’s just the first step in my commitment to learning bread baking techniques, my hope is to one day make our own hangover croissants. In a sauce pan melt butter in milk and sugar. When sugar has dissolved remove from heat and let cool to room temperature. 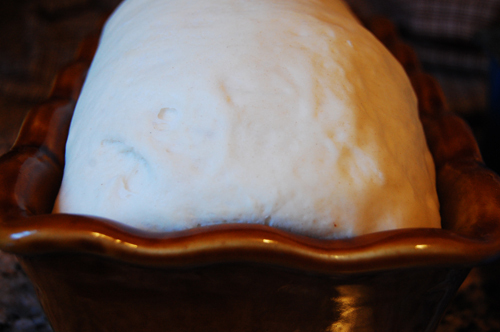 Dissolve yeast in warm water in warmed mixing bowl. Add milk mixture and 4 1/2 cups flour. 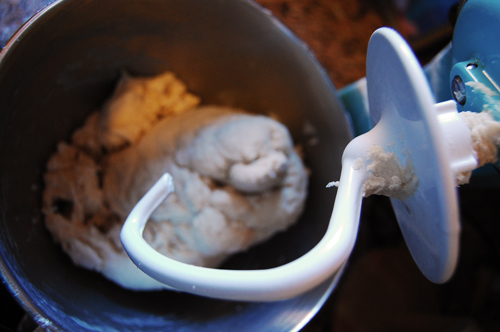 Attach bowl to your stand mixer and begin to knead on speed 2 with dough hook. 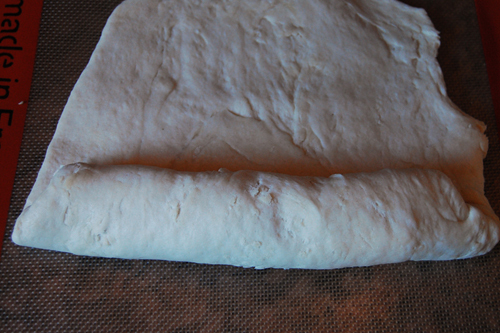 Continue to knead, adding the remaining flour 1/2 cup at a time. Knead until the dough clings to the hook, and then an additional four minutes longer, or until the dough is smooth and elastic. 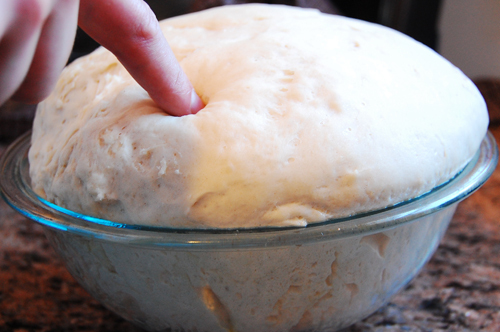 Grease a mixing bowl and place the dough inside, turning once. Cover and let rise in a warm spot for an hour. Punch down and divide in half. Roll out on a nonstick surface. Tuck ends in and roll into a loaf shape. Place in a greased bread pan, cover, and let rise another hour. Bake at 400 for 30 minutes. Turn out onto a wire rack and let cool.